SPEAKING OF EXPLORING CITIES (see what i did there? such a nice segway), i recently had the chance to explore oakland, california for 24 hours with Visit Oakland and it was so fun! myself along with me sweet boyfriend/photographer/videographer/best friend took an early morning flight from portland to oakland and packed a ton of stuff into just one day — so whether the bay area is already on your bucket list or perhaps after this it will be, here's a little peak into what we did (video coming soon)! the first stop of the day was of course checking to our hotel, the oakland marriott, in downtown oakland. it had such a peaceful vibe with all the warm colors and natural woods (my favorite! ), and my room had a lovely view of oakland, the bay bridge, AND the golden gate bridge. one of my favorite perks was the m club lounge, which had tons of snacks and drinks at all times! so whether you're a 'tea at night' or 'toast in the morning' kind of person, there is something for everyone here! the hotel also had a lovely little pool, which i didn't get a chance to go in, but it's on my list for next time! after checking into our hotel, we walked right around the corner to find a super cute juice bar called super juiced! this little place was just adorable and was inside of a sunroom on the side of a building — how cool is that? i had the ginger glow green juice and it was super tasty — a little spicy because of the ginger but i still loved it! if you're downtown and need a quick refresher, definitely pop into super juiced for juices, smoothies, or acai bowls. they have it all! whilst driving to lunch, we came across this huge mural on a side street and i was so intrigued! the mural was literally so big i couldn't fit it all in one photo, but below are photos of my two favorite parts of it! something really cool about this mural is that there are phone numbers under each painting and when you call them, they have an audio recording from the artists telling you the story behind the painting, which is seriously so cool. all of these paintings were created in collaboration with locals from gaza, palestine to raise awareness about the struggles and resistance that have been faced by palestines. such a cool thing that i encourage you to go see and listen to if you're in the area! if you didn't know, i am a huge fan of airplanes (and not just because my boyfriend is a pilot, haha)! i have loved planes and flying and going to airshows my whole life, so i was super excited to find out that oakland had it's very own aviation museum! it was so fun to walk around and look at all the neat old school planes and learn about the history behind them all. oh, and it didn't hurt to have my own personal aviation expert to give me all the fun facts! 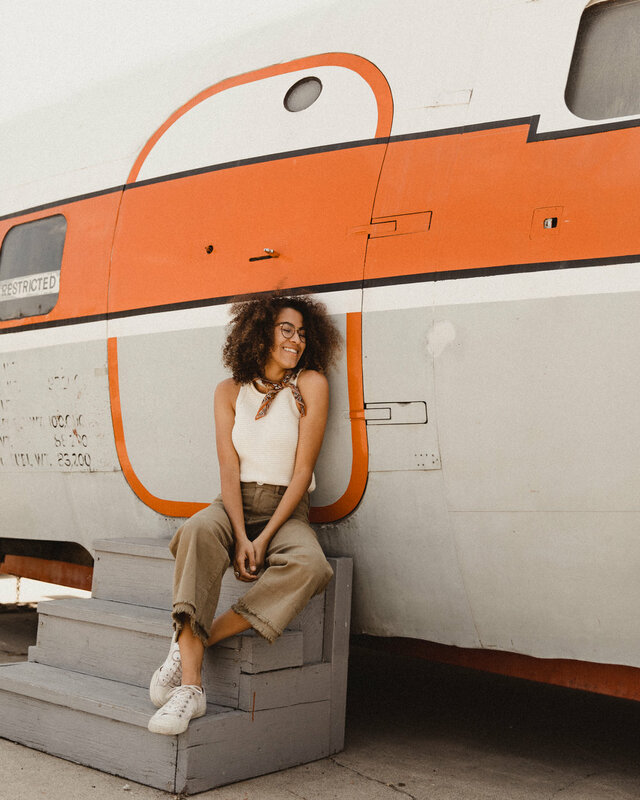 if you find it fun to learn about the history of air travel, this is definitely the place for you! after our exciting time with the airplanes, we decided to take it a little slower and have a walk through the gardens of lake merritt. this garden is SEVEN acres (which is so large for a garden in the city) and it is so peaceful to walk through. one of my favorite things inside is the air bee-n-bee — seriously, how cute is that? such a lovely little home for the bees! there were so many pretty flowers as well, and it was all around such a blissful time! also, it's free. so if you're a nature lover like me, this is a must see. nothing better than a little green in the city! have you ever had the urge to just pop into an art gallery and be a part of a community art project? if not, you should! i'm so glad we walked into the joyce gordon art gallery when we did because we were able to watch artist stevens jay carter in the process of creating a new community mural. he is having locals write three words that inspire change to them and then draw the visual meaning on a heart. he is then incorporating it into his final piece, which i am so excited to see! this was such a cool experience that i feel is so unique to oakland. there is so much art culture in this city, and it is so moving. all in all, oakland is a vibey little city packed with tons of culture and a whole lot of art and soul. so next time you're in the bay area, be sure to hop across the bay bridge and check this fun city off of your bucket list! here are a few more of my favorite photos from the day! *thanks to Visit Oakland for sponsoring this post. although it is sponsored, all opinions are my own!